If like me you are the kind of person whose stupid heart can find sympathy for almost anyone who gives off the slightest whiff of the pathetic no matter who they are, you may feel a tiny pang of pity towards Sean Spicer. Recall all of his public humiliations during his brief stint as the White House press secretary—from making the widely mocked (and demonstrably false) claim that Donald Trump’s inauguration crowd was the largest in history to that thing about “Holocaust centers” to being fat-shamed by Steve Bannon to his many meltdowns during press briefings to reports that he hid in the bushes on the day of his resignation. That pang, however, quickly vanishes once you remember his habitual lying on behalf of Trump, his lack of remorse for enabling some of the most destructive policies of the administration, his willingness to utterly debase himself in his eagerness to gain proximity to power, and the fact that post-White House, Spicer, like many Bad Men these days, knows there is more money to be made by just refusing to go away. 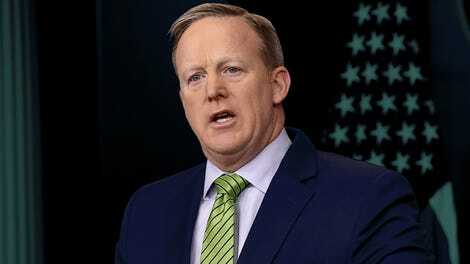 The Briefing, his memoir that came out on July 24 and which recounts, in excruciatingly minute detail, his time in the White House, is only important insofar as it gives Spicer a reason to embark on his comeback tour, launched this month. He is doing his best to extract whatever he can from this moment, bounding from interview to interview—33 alone in one day!—to tell the same stories and offer the same justifications on a tired loop. Spicer’s purposes here are clear enough. What struck me, as I attended one of his promotional appearances in New York City last week, was the extent to which it felt like a public airing of grievances. Less a book event, it felt like a forum for a certain vein of liberal catharsis that lacks other outlets. When I arrived at the Union Square Barnes & Noble, the rows, which were reserved for those who had bought a copy of his memoir, were largely empty, and most of the people there seemed to be journalists and photographers wishing they were somewhere else, myself included. A crowd of about 25 people—those who hadn’t bought the book—were cordoned off behind a security line. 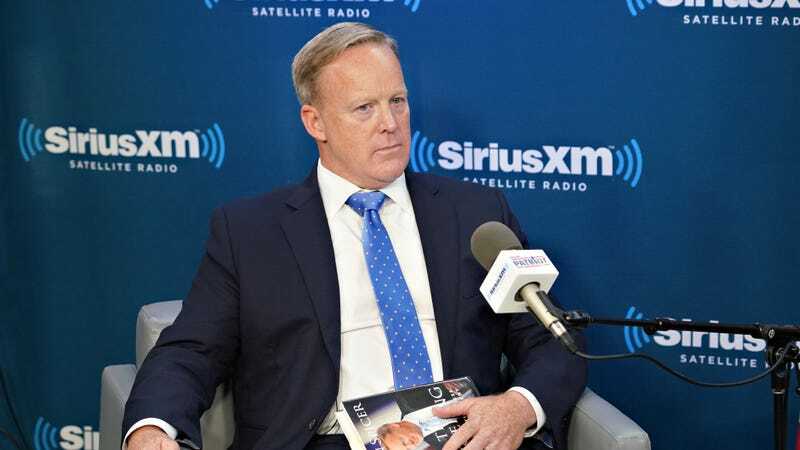 Many minutes after the start time, Spicer finally arrived and leaped onto the stage, a smile on his face, less tan than I recalled and dressed in a light grey suit and bubblegum pink tie, and settled in with his interviewer. He was a few minutes into his talk when the first heckler—a guy sitting next to me, dressed in a blue hoodie and glasses—emerged from the sparse crowd, holding his cell phone up to record his ensuing diatribe. “Hey Sean, you’re a real piece of garbage!” he screamed. Clapping and cheers erupted from people clustered in the back; “Shut up!” someone yelled back at the man in the hoodie. “You’re as stupid as you look!” yelled another, a man in possession of a vaguely New Jersey accent. The heckler continued unfazed: “And I hope you look around and you see all these empty seats and you realize even in New York City, people will not pay money to hear you speak! I’ve read the reviews, it’s a garbage book—” He was interrupted mid-stream as a swarm of security staff descended upon him, who politely asked me to get out of their way, and hustled him out of the room. He kept screaming as he was escorted out: “It’s a garbage book and you’re a garbage person! You lied as press secretary and you’re lying in your book!” Mere seconds later, another commotion erupted as a young man holding up a sign was similarly removed. Spicer soldiered on. We learned about his average workday (He got up at five a.m.! ), his thoughts on the climate of Washington D.C. (“We as a society have to question where we’re heading.” Okay! ), his belief that a “healthy democracy needs a robust and free press,” which drew lots of outraged chuckles from the audience. “We can be critical of government,” insisted the man who, as press secretary, had berated members of the media who tried to do just that. It was at this point that a mother and her young son, blonde as Aryans, left. My mind wandered off as we reached the end of the event, a Q&A session stuffed with pre-selected offerings (What would you like your next job to be? Will you run for office in the future? Is Trump’s tariff plan working? How has your faith prepared you for what you do today?). I could sense many in the audience, already frustrated, likely bored, were simmering with rage. “Why don’t you take a real question?” someone called out. I was fixated on a perfectly coiffed blonde woman sitting two rows in front of me whose cell phone had gone off three times in the span of five minutes when she suddenly stood up. “I just want to know how it feels to profit off of lying to the American public,” she yelled. “I bought your book! It’s okay, I don’t want it, you can have it back!” She strode up to the stage, slammed her book before Spicer, and, to more cheers, triumphantly strode out surrounded by stony-faced security guards. “That was fun,” said Spicer. Later, many of us would watch a clip of the earlier exchange, which made the rounds on the internet the next day. We are still, it seems, eager to see Spicer humiliated again and again and again, a cathartic ritual that leaves undisturbed the fundamental dynamics at play: Namely, that Spicer is doing just fine. In addition to his memoir, he has a talk show in the works, landed a cushy fellowship last year at Harvard University’s Institute of Politics, and joined the pro-Trump super PAC America First Action as a spokesperson and adviser. Our favorite punching bag, like so many who have departed this administration, is facing no real repercussions stemming from his time at the White House, despite early predictions that to join this administration would be a kind of national betrayal or career death. Yes, Spicer may have felt a brief flare of embarrassment to be the subject of yet another personal degradation—but it is equally if not more degrading for all of us who experience a moment of glee at seeing him being taken down, and then belatedly feel a sharp despair upon realizing that actually, it’s us who are being played yet again. After all, I bought his book.